You’ve got two choices when it comes to digital marketing, but it isn’t either or. In the big not-so-scary world of digital marketing, you can opt to pay an agency to help manage your marketing efforts for you, or you can put your SEO, PPC, outreach and social media hats on and do it yourself. Or, you can mix the two together for the ultimate GIANT marketing machine. Like many things in life, using a marketing agency can have its ups and downs – but so can going it alone. The type and size of business you have, how much you want to happen, and how much cash you have are all important factors that can influence your decision. Fortunately for you, we’re on hand to help you weigh up the pros and cons of each, and help you make the right choice for your business. The main advantage of using a digital marketing agency is you’ll be given a whole team of experts, whose literal job is to help you get your website noticed online and boost those all-important conversions and sales. These people (like all of our lovely GIANTS) are trained experts in areas like SEO, PPC and social media, with some having years and years of experience helping people with their unique digital marketing needs. While you may have some experience with SEO, PPC and social media, going it alone denies you the unique knowledge and experience that a qualified team of experts brings to the table. We know that when it comes to running a business, you’ve probably got better things to do than stare at a screen for 7 hours a day 5 times a week – that’s our job. Using a digital marketing agency helps free up your all-important time to focus on other areas of your business that need attention – which can help your company to grow and progress. Depending on the size of your website and how much work you want to do, digital marketing can easily eat into your time. Add in all the different tools you need to keep up to date with and it can end up being a very time-consuming job – sometimes we wonder how we even find time for ourselves! Of course, if you opt to use a digital marketing agency, any content created is put in the hands of the marketers. Only you know the tone and style of writing you want for your business, and while briefs and explanations can help give marketers what they need to write killer content, sometimes things don’t come out exactly as you planned. If you write the content yourself it can feel like this will eliminate the problem, but it can be time-consuming to produce content on a regular basis – so try to evaluate how much time you can dedicate to this area before you make a decision. If content is king, consistency is its best friend. It may come as surprise, but digital marketers have to eat and pay bills too, meaning it costs money to hire their services. For some businesses, paying for marketing services, especially if you want expertise in more than one area, can end up costing a fair sum every month. The good news though is that effective marketing can help you make that money back with inbounds, as long as you’re aware that, depending on the channels you choose, this can be over a long-term period. Plus, you always have the option to hire an agency for some aspects of your marketing strategy and not others, in order to cut costs. Perhaps you want help managing your PPC campaigns, but you’re happy to write your own blog content, for example. Discuss your needs both internally and with the agency, and you should be able to find a middle ground that doesn’t break the bank. If you’re thinking about going for a DIY approach, then don’t panic – you’re not out on your own. Invest in some training to give you a head start, like the courses run by our sister company, Giant Campus. With options like Intro to PPC, Intro to SEO, and Social Media for Business, they’ve got everything you need to get on the right path. 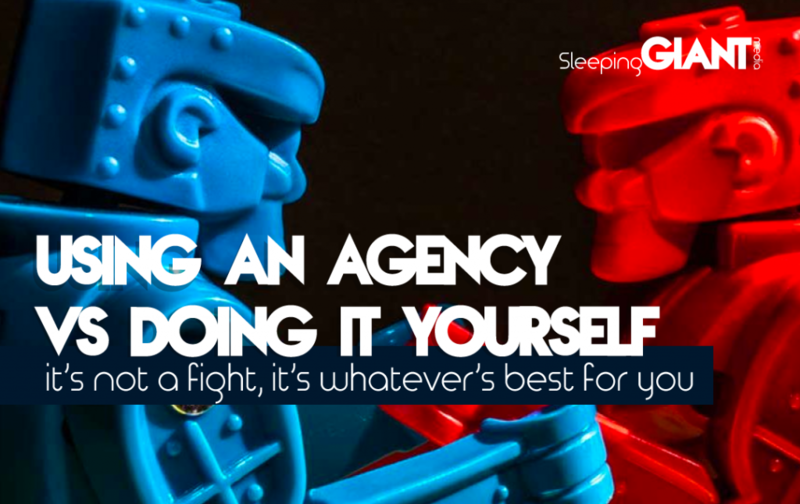 Still unsure if hiring an agency is right for your business? Why not give us a call – we’re a friendly bunch. 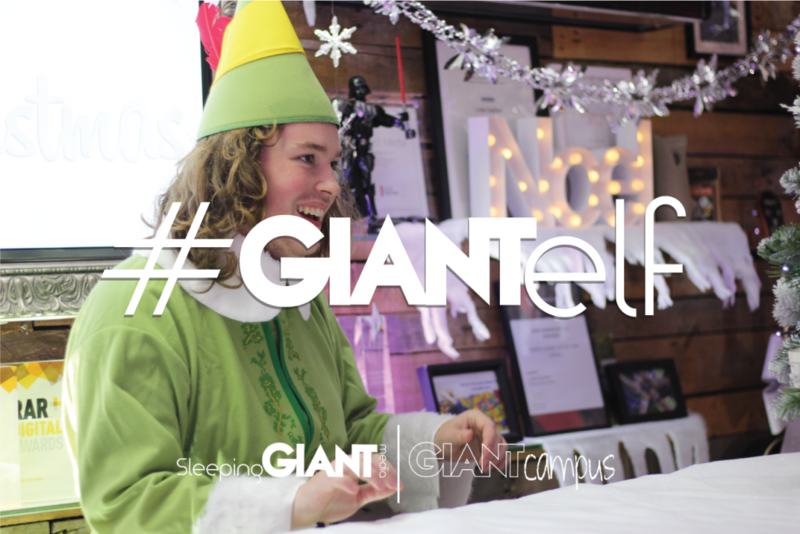 Why not try your hand at winning a GIANT for a day for your business? They can come in and help you with your digital marketing needs – this is the third option we didn’t mention before… cos, well… it’s rare! Just check out our Christmas Campaign and fill out the form with your details and the answer to the question to be in with the chance.